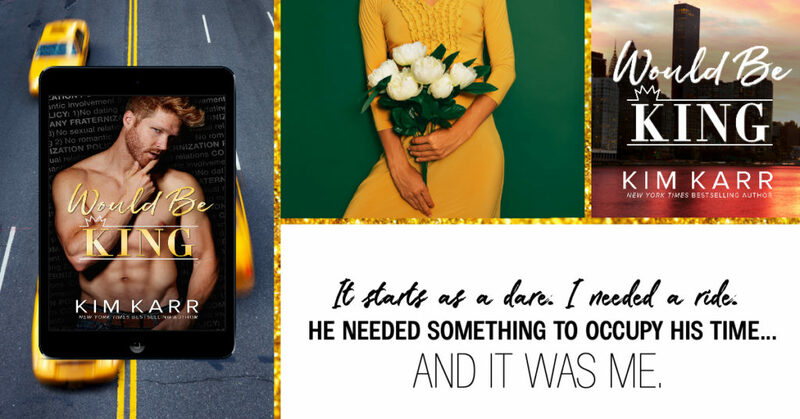 I dare you not to fall in love with Prince Maximus Napoleon Montgomery – the ginger heartthrob who’s taking New York fashion industry by storm and razing a little hell in the process, even if he’s supposed to be keeping a low profile. This ‘would be king’ has gotten himself into quite a bit of trouble, so he’s been shipped off to the states to right his ship, so to speak, in order prepare himself to fulfill his royal duties and prevent anymore unwanted bad press for his family’s name, but once a rascal, always a rascal, which means that Max doesn’t even have to be looking for trouble for it to find him, and with social media and the paparazzi constantly in both his personal and professional life, they’re bound to catch him in some rather precarious positions with quite the lovely American commoner regardless of the fact that he’s her boss and there’s a company no fraternization clause in place. Gigi Gatsby is a pocket full of sunshine, which is exactly what Max finds most attractive about her. She’s creative, intelligent, and genuine, which is something lacking in the people Max usually surrounds himself with…these two have incredible chemistry and their attraction to each other is palpable but there are huge obstacles in their way that not even the brightness of Gigi’s heart and soul could surmount on their own. Kim Karr expertly uses social media to help tell Max and Gigi’s story.The Casanovia Conquest and Tweets are perfectly placed and shed light on the way of the world when it comes to celebrities and royals. They also allow readers to see exactly how enamored society is and how free they are with their words while hiding behind their computer screen. It’s also a great way to show instead of tell specific details when it comes to what Max and Gigi have to deal with, especially Gigi when she has to accept information and figure out if it is the truth or more lies. 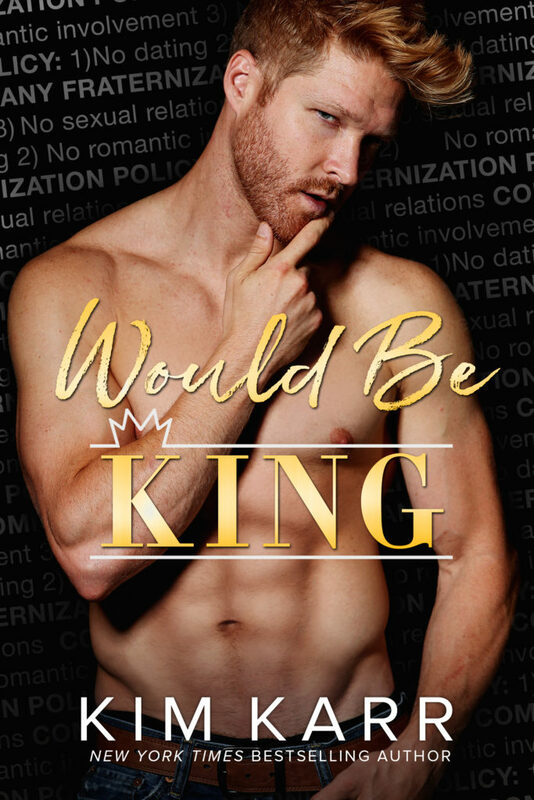 There’s quite a bit of drama to be dealt with in Would Be King, which is logical given Max’s royal heritage, the position he’s required to take, and the fact that what he truly craves is something he may not be able to keep. 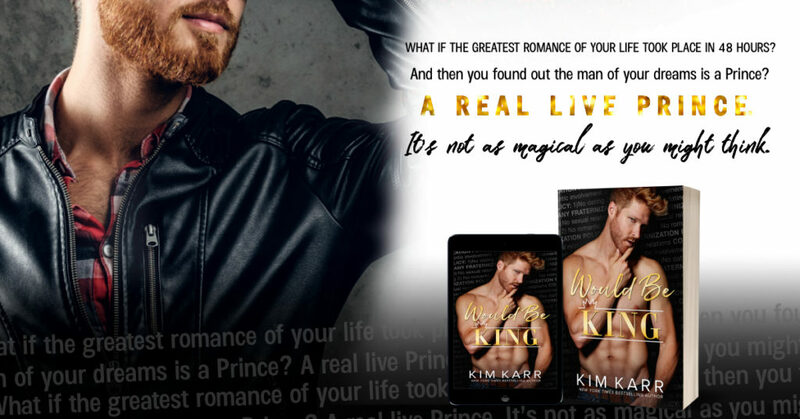 I absolutely adored Max and Gigi’s story; it’s royally entertaining, heartfelt, and swoon worthy, and Max is definitely at the top of my list of all of Kim Karr’s book boyfriends.